Since this recipe is good either warm or at room temperature, and because it keeps for several days, it is a perfect make-ahead recipe for parties. Our already cooked octopus legs take much of the work and time away from the recipe. First you’ll need to tenderize the octopus. Here’s how i do it: first bring a large pot of salty water to a boil. Boil the octopus in the water for 2 minutes, then remove to a cutting board. While the octos are cooling turn the oven to 225°f. Line a dutch oven or other heavy, lidded pot with the parsley, fennel fronds, oregano, green onions and the bay leaves. Trim icky fatty bits from the octopus and clean out the heads (normally this last step has been done for you, but not always). Cut the octopi into several pieces and nestle into the pot of greens. Cover the pot and cook for 90 minutes to 4 hours, depending on how large and tough the octopi are. I typically shoot for 2 hours. Don’t worry about the lack of liquid in the pot: the octos will release enough to make a flavorful broth. 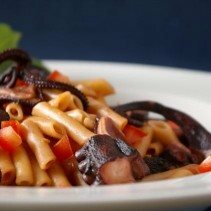 When the octopus is tender, remove from the pot and cut into serving-sized pieces like you see in the pictures. Coat with some of the olive oil and either grill or broil until you get some char marks, about 8 to 10 minutes. 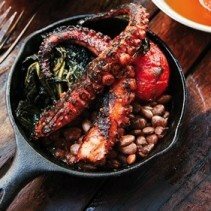 Toss the octopus with the rest of the olive oil, the paprika, smoked paprika and cayenne. Add salt and black pepper to taste and serve with lemon wedges, either at room temperature or slightly warm. Serve with bread.